There are many models of dehydrators on the market that are appropriate for home use that meet a variety of needs and budgets. For some users, dehydration is a complementary method to canning and freezing that gives you the option to preserve more types of foods. Many people are devoted to dehydration as a primary method of food preservation that retains nutrition and makes traveling with all types of food possible, without worry of spoilage. The STX International Dehydra is a commercial grade dehydrator that exceeds the capabilities of most home machines. The unit has more power, more convenient features, and a much greater capacity than the majority of dehydrators found on the market today. Consumers who are looking for a top-of-the-line dehydrator for large capacity use will appreciate the convenient features and the durability of this machine. The STX International Dehydra has 10 stainless steel trays for a combined 16 square feet of drying space. Most other dehydrators are either made of plastic or are stainless steel with trays made of plastic or have a plastic lining. The trays in the STX International dehydrator are 100% stainless steel and are not chrome plated. The Dehydra has 1200 watts of power, combined with temperature settings of 95° to 165° for the most effective heating of all types of foods. The high temperature capability makes this dehydrator a must-have for jerky makers. Less expensive models of dehydrators use a vertical airflow system that makes drying foods more difficult. The STX Dehydra implements a horizontal air flow system with a 7-inch fan mounted at the rear of the unit. The air flows evenly across all of the trays so that all foods are equally and consistently dried. When I make jerky, I like the way the dehydrator dries all of the meat evenly and gives the jerky the right texture regardless of how full the unit is. In spite of the size of the fan and the power behind it, the unit is still exceptionally quiet to operate. The STX International Dehydra is 100% digitally controlled and has a 15-hour shutoff timer for exceptionally ease of use. Clean-up is an issue with many dehydrators that users won’t encounter with the STX-Dehydra. 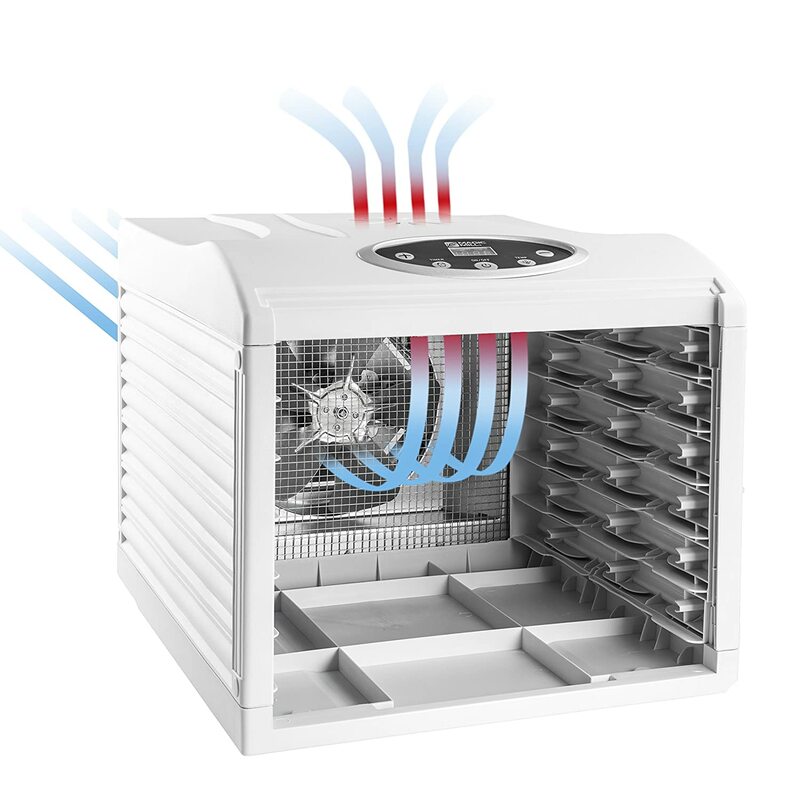 The rear heating/fan section can be quickly removed from the rest of the unit for easy access. The stainless steel drying racks can also be removed with the slide off rack guides, making it possible to power wash the entire front section. The included drip tray also helps to keep the machine clean during use. The STX dehydrator comes with a drip tray and 2 silicone mats for making fruit leathers or roll-ups. The power and horizontal air flow system give the STX Dehydra the drying power that makes preparing jerky completely safe. The extra-large capacity is an obvious advantage, especially for consumers who want to dehydrate foods on a large scale. Easy cleanup allows users to move effortlessly from batch to batch while the square shape makes the unit easier to fit onto kitchen counters or tables and keep it out of the way when not in use. The only con for this dehydrator is the price. The advantages of having a commercial quality dehydrator that performs efficiently and offers ease of use makes it a real value for consumers who want to achieve a professional level of food preservation, both in quality and volume. More than 30,000 of these units have been sold across the nation during the past seven years with a collective 99+% Customer Satisfaction Rating. Buyers find the STX International to be a sturdy, durable dehydrator that continues to perform up to the standards of a commercial or industrial level machine with repeated use. Buyers also appreciate the level of customer service provided by the company that makes the dehydrator. Read customer reviews. All STX Products come with an amazing 3-year warranty, including parts and labor. This type of backing reflects the confidence the company has in their product. The STX International Dehydra is typically one of the more expensive dehydrators. The best deals can usually be found at Amazon. Look here to find the lowest price. The Hamilton Beach 32100A dehydrator is a mid-sized appliance for people who want to make healthier snacks. The unit is versatile enough to use for drying herbs out of the garden, making fruit rolls without preservatives or additives (nitrite and sulfite), creating dried fruit without the added sugar of commercial dried fruit, and making more flavorful homemade jerky. The simple design of the dehydrator makes it easy to preserve the nutrients of a wide variety of garden fresh fruits and vegetables. You can also purchase frozen or canned fruits and vegetables to dry in the same way. Buyers like the simple design of the Hamilton Beach 32100A and the square shape that makes it more convenient to place on a kitchen shelf. The square design of the trays also makes it easy to put them in the dishwasher for fast and easy cleanup. Waiting on the dehydrator to finish drying foods is my least favorite thing about the process. It never fails that when I think I have the day to devote to dehydrating, something comes up and I end up having to put off the dehydration until later, even if I have the food ready to go. With the 48 hour timer and auto shutoff features of the Hamilton Beach unit, I don’t have to worry about having to leave unexpectedly. I just set the timer to the appropriate amount of time for the food I am drying and let the unit take care of the rest. 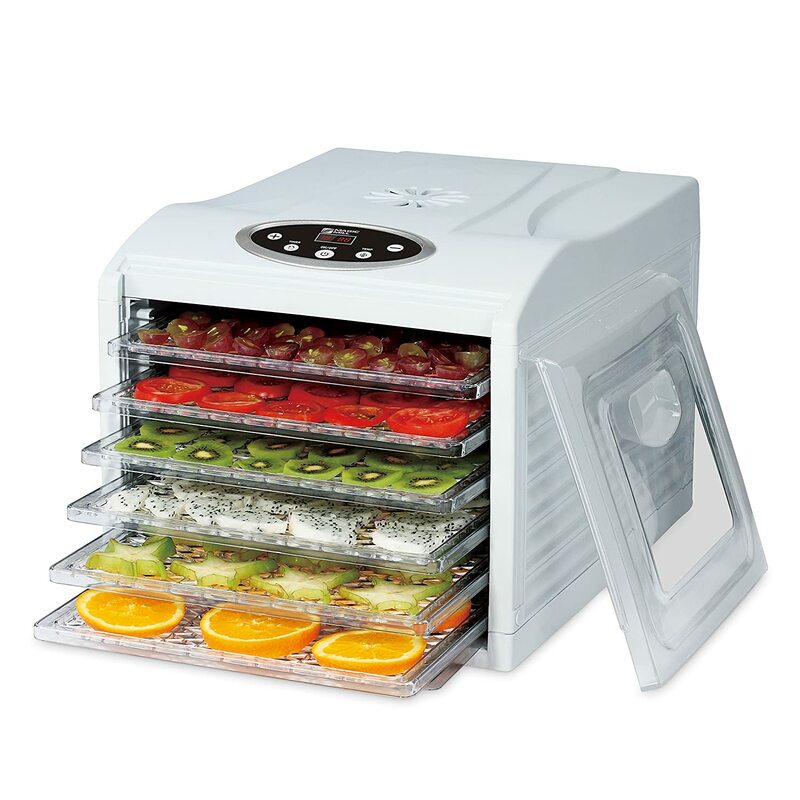 Many buyers of the Hamilton Beach like the way the dehydrator dries foods evenly without having to rotate the trays. Without this feature, the automatic timer would be worthless. Even if you have to leave the dehydrator to perform its magic alone, all of the food in every corner will be evenly dried. The versatility of the dehydrator depends on the ability to adapt to the requirements of a variety of foods. The adjustable thermometer lets you set the unit at the right temperature between 100° and 160° F for whatever you are drying to ensure the food is completely dehydrated when you remove it. The Hamilton Beach dehydrator comes with two specialty sheets for even greater versatility. A mesh sheet can be placed on a tray to prevent smaller pieces from falling through. When dehydrating herbs from the garden or small plants to use for potpourri, this sheet will keep them in place. The solid sheet can be used to make delicious, natural fruit rolls without additives and preservatives. Puree your favorite fruits and spread on the solid sheet. After dehydrating, the fruit rolls peel off. Most dehydrators have a solid lid that won’t let you see the food unless you open the unit up. The clear lid on the Hamilton Beach dehydrator lets you see how the dehydration process is progressing without interrupting. The simple use of the Hamilton Beach dehydrator makes the unit a good choice for anyone regardless of a lack of experience at drying food. The unit is highly versatile and can be used to dehydrate fresh, canned, or frozen foods for a wider variety of snacks. It is also efficient at making homemade jerky and extends the use of herbs and spices grown in your home garden. The simplicity and versatility of the Hamilton Beach 32100A make it a perfect choice for many buyers, but it is not the best choice for everyone. The 5 trays that come with the unit are the maximum capacity and additional trays cannot be added. For users who want larger capacity and more powerful drying for a faster process, there are other choices that are more appropriate. For users who are looking for a convenient and simple way to make a variety of healthy snacks, this dehydrator is sufficient. Buyers find the Hamilton Beach dehydrator to be a better performing unit than those of comparable price from other brands. This unit also offers easier cleanup and is easier to use than many other models. You can read consumer reviews here. Most online retailers sell the Hamilton Beach 32100A relatively inexpensively. The best deals can usually be found at Amazon. Check here to check the lowest price.